This roundtable considers the contemporary expressions of these Caribbean, American and African women dance artists, engaging participants in a dialogue concerning experimentation, performance, pedagogy and migration as they relate to African and African diaspora arts. Underlying these concerns will be an attention to gender, race, and the power structures surrounding them. This workshop with Léna Blou, Rujeko Dumbutshena and Yanique Hume will materialize a call and response between Caribbean and African dance vocabularies and musical rhythms. Each artist will share her own dance(d) research and engage participants through movement, language, and rhythm. Hands-on workshop designed for dance enthusiasts to learn how to tell their personal story in the context of developing African diasporan dance. The focus is on building writing skills to encompass both one’s microcosmic individual story and the macrocosmic larger field of black dance. How has your dance story shaped the dance field where you are from, and how has the dance in your location(s) shaped your dance experience? The workshop also helps the dancer-choreographer understand periodization, and how to capture the time era encompassing one’s own personal dance story. Dancers need to write our stories, which will in turn help our audience understand what we know to be true about the black dancing life experience. The participants end the workshop with an example paragraph about their own personal dance story as inspiration for further memoir writing. 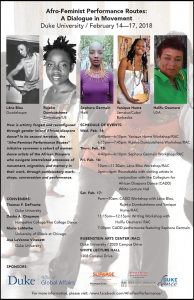 Both dancers and dance writers can benefit from this workshop experience, as it honors the contributions of various geographical and temporal eras of black dance contributions. As both a former dancer-choreographer and dance scholar, Halifu Osumare can help the dancer and the dance writer to find the poignancy of their personal story. My own memoir, Dancing in Blackness: A Scholarly Memoir, is forthcoming by University Press of Florida. LénaBlou is one of the emblematic figures of Caribbean choreographic art. She remains an avant-garde to want to demonstrate the contemporaneity of the traditional dance of Guadeloupe (gwoka). For the whole of her career she was promoted by the French Government to the rank of Knight of the Legion of Honor and Officer of the National Order of Merit. As a dancer, choreographer, educator and dance researcher, she has been founder and director since 1990 of the Dance and Choreographic Studies Center and the company Trilogie in 1995. In 2017, she created her own place Larel Bigidi’Art (LBA) that receives both his school and his company but also professional training as well as performances and choreographic workshops. LēnaBlou, began dancing at the age of six and has since continued to improve, confront and interact throughout his career alongside the greatest (Maurice Béjart, Walter Nicks, Carolyn Carlson , Anna Czajun, Vendetta Mattea, Jean-Claude Gallotta, Alvin Mac Duffy, Joe Alegado, etc.). She began her career by enrolling at Paris Sorbonne IV University for a professional dance course. She obtained her DEUG dance, coupled with her diploma of choreographic interpretation in jazz, then her diploma of state in contemporary and in jazz (1993). She completed her professional course by obtaining in 2003 her certificate of aptitude to teach which allows her to teach in French national conservatoires. She began a research work on the traditional dance (gwoka) of Guadeloupe, in parallel with her career as a choreographic artist. Tireless, she resumed her studies at the University of Martinique and completed her studies with a Master II in 2015 (arts, letters and civilizations). She is currently a doctoral student in anthropology of dance at the University of the West Indies of Guadeloupe. Research on the paradigm and taxonomy of gwoka dance invites LēnaBlou to defend the principle of a new Caribbean aesthetic, but also a new trend of thought: the Guadeloupean philosophy, that of Bigidi. She is regularly invited for articles, lectures on the Bigidi concept, Techni’ka master-classes both in Guadeloupe and abroad (University of West Georgia – Emory University – Kennesaw State University – Auburn Avenue Research his intellectual and artistic approach is based on a filmography: Cassa-Cassa by Élodie Lefebvre (2012), Le pays à l’envers by Sylvaine Dampierre (2007), Techni’ka by Laurence Rugard (2006) LēnaBlou continues to broadcast the repertoire of her dance company in theaters, festivals abroad (Theater Scotian Bank in Vancouver / Canada, Festival Edanco / Santo Domingo – Domfesta / Dominica, Teatro Del Centro de Las in Monterrey – Teatro Del Estado in Xalapa / Mexico Dance Festival Kaay Fec / Senegal, Teatro Trasnocho in Caracas / Venezuela, City of Arts in Lafayette – Xavier University of Louisiana in New Orleans – Afro American Cultural Center in Charlotte / USA. Rujeko Dumbutshena is a Zimbabwean-born dancer, pedagogue, and scholar specializing in contemporary African dance. She is currently on the dance faculty at the Central New Mexico Community College. Before coming to New Mexico, she served as a faculty member at Sarah Lawrence College for eight years. Rujeko is also a MFA candidate at the University of New Mexico. She teaches neo-traditional and contemporary African dance and is conducting scholarly research on the interplay of gender and power in the rituals of communities in Zimbabwe. Rujeko has directed African dance conferences and performance and has been invited to be a part of numerous productions, workshops and conference. Her artistic career was propelled by being an original ensemble member in the Broadway musical production of FELA!. She was commissioned to produce a choreo-poem for the Smithsonian African Art Museum’s African Cosmos exhibit in 2013. In the same year, she became a BAM/De Vos Institute fellow. She was an artist in residence at the University of Rochester in November 2015 and Duke University in April 2016. Dancer and teacher Sephora Germain is a soloist of Ayikodans, Haiti’s world-class professional dance company founded and directed by Jeanguy Saintus. Since infancy, Sephora found joy in moving her body and expressing herself through Haitian popular dance forms but began professional dance studies years later, as a young adult. From 2006 to 2009, she first took formal dance classes at the Haitian dance school Bazilik Kreyol, and gained performance experience with the school’s troupe. In 2010, during International Dance Day, she attended an open house session at Jeanguy Saintus’ dance school Artcho Danse and she hasn’t left since. She was a scholarship student of Artcho’s apprenticeship initiative “Dansepyenu” (“Dancebarefeet”), an intensive training program in Haitian traditional dances and modern dance for promising underserved Haitian artists. Then, in 2011, she was promoted to a full-time position in Ayikodans, the school’s professional contemporary dance company. Since, she has performed as an Ayikodans soloist at festivals and in major venues in Haiti, the Dominican Republic, Barbados, French Guyana, the United States, Switzerland and Sweden. She is also a teacher who instructs dancers of all ages in Haiti and elswhere. Her classes engage how Haitian dances called “traditional”––to mean, stuck in time and space––have always developed with their time, space, environments and interpretors. Her dance pedagogy invests in a vision of Haitian dances that pays homage to the cultural and religious roots of national dances as she directs attention to how these dances been always been contemporary, and attempt to create spaces free of gender, sexual, race and class discrimination. Yanique Hume holds a PhD in interdisciplinary studies from Emory University and is a lecturer in Cultural Studies at the University of the West Indies, Cave Hill Campus (Barbados). She specialises in the multidisciplinary field of Caribbean Cultural Studies with a focus on Cuba and Haiti. Her research and teaching areas include: religious and performance cultures of the African diaspora, Caribbean thought, popular culture, migration and diasporic identities. Yanique is the co-editor of two anthologies, Caribbean Cultural Thought: From Plantation to Diaspora (2013) and Caribbean Popular Culture: Power, Politics and Performance (2016). Among her current projects include a special issue with the Journal of Africana Religion on the aesthetics of death and an edited volume on the Caribbean mortuary complex, Passages and Afterworlds, which is due to be released in 2017 by Duke University Press. Yanique is also currently developing a monograph on the Haitian presence in eastern Cuba entitled, Haiti in the Cuban Imaginary. Yanique is the recipient of grants from the Social Science Research Council, the International Development Research Centre, Ford Foundation and the Wenner Gren Foundation for Anthropological Research. Outside of her academic work, Yanique is a professional dancer and choreographer who has toured extensively with several dance companies and continues to teach the scared and popular dances of the Caribbean region. Choreographer and Scholar Halifu Osumare has been involved with dance and black popular culture internationally for over forty years as a dancer, choreographer, teacher, administrator and scholar. She holds a M.A. in Dance Ethnology and a Ph.D. in American Studies. Dr. Osumare is Professor Emerita of African American & African Studies at University of California, Davis, and is the author of The Africanist Aesthetic in Global Hip-Hop: Power Moves (2007) and The Hiplife in Ghana: West African Indigenization of Hip-Hop (2012). Her memoir, Dancing in Blackness, published by the University Press of Florida, is due in February 2018. As a dancer she is a former soloist with the Rod Rodgers Dance Company of New York City, and the Founding Artistic Director of CitiCentre Dance Theatre in Oakland, CA., formerly a key organization in what is now the Malonga Casquelourd Center for the Arts. She is a Certified Instructor in Katherine Dunham Technique, and the former Co-Director of the Institute for Dunham Technique Certification (IDTC). Her vision of social justice, like her late mentor Katherine Dunham, is the integration of the arts and the humanities to humanize all receptive souls. Mario LaMothe is a Postdoctoral Associate and curator-in-residence at the African-American Cultural Center of the University of Illinois at Chicago. Dr. LaMothe received a doctorate in Performance Studies from Northwestern University in 2015. From 2015-2016, he was a Postdoctoral Associate in Interdisciplinary Sexuality Studies at Duke University’s Program in Gender, Sexuality and Feminist Studies. Dr. LaMothe is also a performing artist, curator and LGBTQI activist. His research agenda involves embodied pedagogies of Afro-Caribbean religious rituals, and the intersections of spectatorship, queerness and social justice in the African diaspora. He is completing his first book project Vodou/Voodoo Bodies: Artistry, Memory, and Imagined Haitian Identities, which deals with recuperative performances of blackness in the circum-Atlantic region. Through ethnographic research, he situates how Haitian choreographers Jean-René Delsoin, Roxane D’Orléans Juste, Kettly Noël and Jeanguy Saintus, working respectively in Haiti, Canada and Venezuela, Mali, and the United States, leverage the aesthetics and embodied techniques of Vodou, the Afro-syncretic religion of Haiti. Vodou/Voodoo Bodies directs attention to the affective ways the artists’ choreographies engage spectators in simultaneously reviving and destabilizing their own misconceptions about Haitians. Dr. LaMothe co-edited the June 2017 special issue “Nou Mache Ansanm (We Walk Together): Queer Haitian Performance and Affiliation” for Women & Performance: a journal of feminist theory with Dasha Chapman and Erin Durban-Albrecht. He has also published essays in academic and public humanities journals and books. The event is sponsored by SLIPPAGE: Performance|Culture|Technology, directed by Thomas F. DeFrantz; Duke Dance Program; the Franklin Humanities Institute John Hope Franklin Afro-Diasporic Legacies Series; and the Duke Office of Global Affairs. For more information, t.defrantz@duke.edu. Afro-Feminist Performance Routes is powered by WordPress at Duke WordPress Sites. Please read the Duke Wordpress Policies. Contact the Duke WordPress team.